Host Susie is joined by Dennis– content curator extraordinaire– of the Mia San Rot website to chat about a win most people could care less about, and a loss that most everyone cares about. Bayern got a slow start against Hannover, but eventually ran out 3:0 victors in what is now a basically meaningless Bundesliga match. And the big stuff comes in the second half of the pod where we’ll discuss the 1:2 loss at home to Real Madrid, and all the news surrounding the Champions League semi final tie. Before delving in to the pair of matches, Susie and Dennis chat about their geek fandoms and why exactly the podcast was being recorded in the middle of the night in Germany. Whew. The loss to Real Madrid is the heart of the podcast– with a few segues elsewhere– as the duo break down the match tactically, and call out performances pretty much across the board. Might Jupp Heynckes have been able to change the match more effectively had he not been hampered by two early substitutions? Is Robert Lewandowski really a flop for Bayern? What did Madrid do particularly well? Did Franck Ribery really have a “great” match? Assessing Bayern’s chances in the return tie at the Bernabeu– and how Bayern might go through to the final are talked about before ending with some thoughts on Niko Kovac, Eintracht Frankfurt, Saturday’s match and the Pokal finale. Thanks, loyal listeners, as always. We’ll be back shortly! Mia san mia. 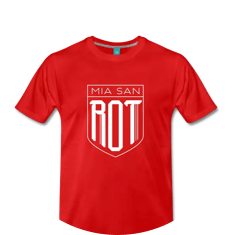 Mia san Rot.